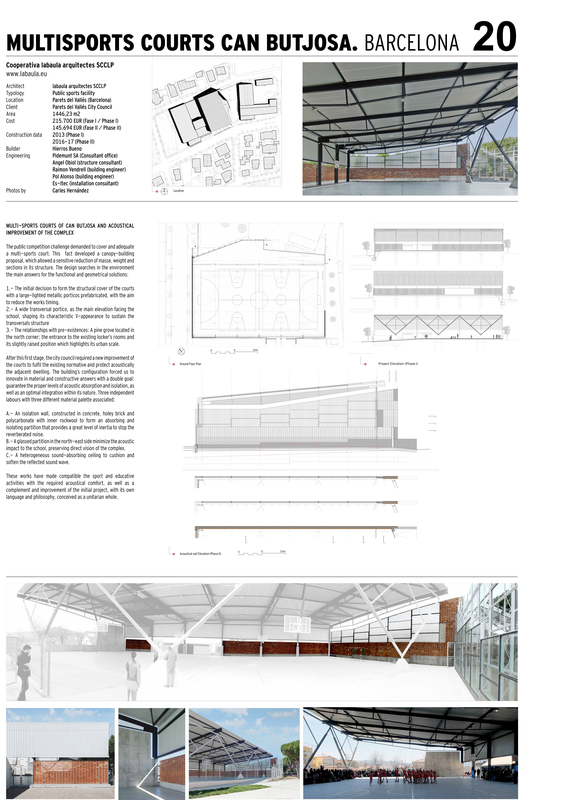 1.- The initial decision to form the structural cover of the courts with a large-lighted metallic porticos prefabricated, with the aim to reduce the works timing. 3.- The relationships with pre-existences: A pine grove located in the north corner; the entrance to the existing locker’s rooms and its slightly raised position which highlights its urban scale. A.- An isolation wall, constructed in concrete, holey brick and polycarbonate with inner rockwool to form an absorbing and isolating partition that provides a great level of inertia to stop the reverberated noise. B.- A glassed partition in the north-east side minimize the acoustic impact to the school, preserving direct vision of the complex. C.- A heterogeneous sound-absorbing ceiling to cushion and soften the reflected sound wave. These works have made compatible the sport and educative activities with the required acoustical comfort, as well as a complement and improvement of the initial project, with its own language and philosophy, conceived as a unitarian whole.